Antler & Scrunchy Collar with Bells - Combo for Dogs! SO ADORABLE! Dress up that sweetie this holiday, what an adorable costume combo! ***.. This beautiful Christmas dog collar is adorned with crystal bones for adding a little bling to your .. SO CUTE! 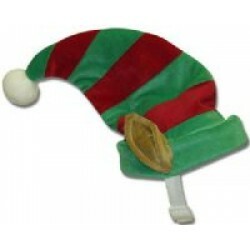 Tiny Jingles have 3 tiny jingle bells - 1 each in red, green and gold. These clip eas.. Dress up your pup for Christmas in this 1" wide Red Plaid dog collar which is made of durable n..
Don't forget your fur-baby this Christmas. You can personalize this bone-shaped ornament w.. These wood photo frame ornaments are perfect for capturing that adorable little face on your Christm..
ADORABLE STOCKING STUFFER! Cute green bow & red embroidered buttons! 5" soft & pl.. These beautiful Holiday Slider Charms are chrome plated, Czech crystal charms for sliding onto our 3..